I will take 5 years of nikolas & goldsmith?? Over 10 years of Bruce any day. The Cardinals seem to agree on this -- except for the spellings of the names. Was concern over Ozuna's shoulder (if there is any) part of the reason they changed their tune on keeping Jose? My answer on this hasn't change chat to chat this winter: That's a spring conversation. The reasons were explored moments ago in the chat. Does Goldschmidt wearing #46 both you like it bothers me (aesthetically I mean)? Honestly when he is mashing homers or playing goldglove offense it won't matter one bit but it just looks weird to me to see an MVP candidate 1st baseman wearing #46 instead of a backup catcher or bullpen arm. I am enthusiastically ambivalent about this. You can't put players on the 60-day DL until the end of ST, right? So if they wait until then to sign more players, aren't they facing the same problem as last year with Holland? And do they expect they can lure some of these really good FA options to accept a minor league deal to be added later? It's midway through March when that can happen. And yes the Cardinals are looking at minor-league offers to make, like they did for Neshek. For Fowler and for Cecil and for a handful of others it is incredibly important. I mean, usually a strong start by a team is important. It's one of the things that Tony La Russa would always talk about: strong Aprils. He didn't want two months of spring training games. He wanted to be game-ready at the end of spring and have strong Aprils as other teams tried to find their rhythm. He felt there were wins to steal in April because other teams were still wobbly, still searching, still in spring mode -- and his teams were playing at a regular-season rpm sooner, faster, and better. I imagine Shildt has heard that from TLR -- or will -- and it wouldn't be a surprise to hear the team talk about that being a goal as they play exhibition games in March. IMHO Carpenter is more than fine with regard to the shift. He bunts often enough that teams have to respect it.That's all you should ask for from high OPS hitters, particularly ones who work hard for walks. Also, he bunts competently, which should be a given but sadly is not, but props to him anyway. From what I've read, some of these players (the players that are holding up much of the market), have good offers but maybe they don't want to play on those teams. Why should a player expect the years they want, the $$ they want, the opt-out they want so they can chase something else in a few years, AND also demand that offer come from a team they want to play for? For all the talk of the owners, it's the players that I think are being unreasonable at times. Players should expect to get everything and anything that the owners are willing to offer. That's how a free-market should work. They have talent. The market has defined what they can expect. See Heyward. See Stanton. See Martinez. And on and on and on. And I say they should go for every last penny possible. Does signing Goldschmidt to a long term deal prevent us from signing anyone else long term (Arenado, Ozuna). Is it a pipedream to think of Arenado and Goldschmidt starting at the corners for us in 2020? It's possible to see how the math would work with contracts melting off at season's end. There are a lot of deals coming to a conclusion. With the current FA landscape, what would a Ozuna contract look like next year assuming somewhere between '17 and '18 production? No clue. Free agency is broken. How do you think the WWU was for Goldschmidt? Did it seem like he was enjoying Cardinal Nation? He seemed to. We only spoke to him that one time. His manager and other players said he enjoyed himself. I guess that's what we have to go on. I imagine that the regular season is far more important to his decision and the contract the Cardinals offer will mean a lot more than the Warm-Up. I am having a hard time accepting the supposed Cardinals interest in Arenado, because I heard all the same statements last year about Machado and Harper - how excited the team was because these guys were hitting the free agent market so young, which would make a long contract acceptable. Fool me once, shame on them. Fool me twice - we’ll, I’m from Missouri, I’ll have to see it to believe it. Fine. I report. You decide. Moving on. The Chicago Trib had the following as part of a Paul Sullivan article on the Kris Bryant tempest in a tea pot... "No one in Chicago cares about this, of course, but St. Louis reacted like it was a declaration of war. 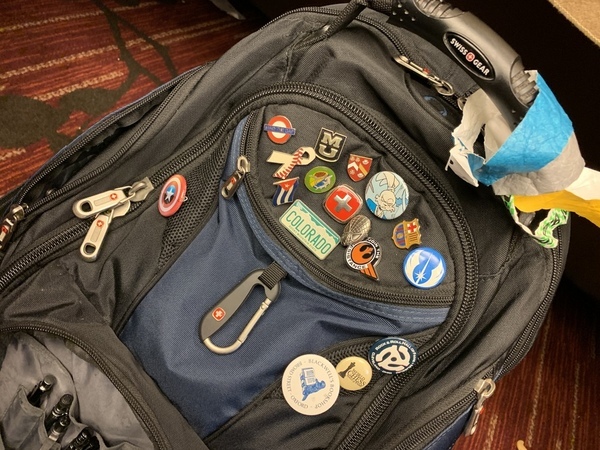 The St. Louis Post-Dispatch featured a slew of stories on the Bryant-Dempster insults, and beat reporter Derrick Goold even took an unprovoked at my computer bag on Twitter, calling it “rather boring.” What's your relationship with Sullivan and what is he referring to on the computer bag? This whole thing has me chuckling. Do you have a few hours? Paul Sullivan is a friend, a mentor, and a guide in this business of baseball writer. He was one of the first of the established ballwriters to really welcome me to the fold, and that meant a lot. It can be ... tricky. I openly envy the fact that he learned from Royko and got to work with one of the best newspaperman ever. I mean, ever. Sullivan is Chicago through and through, a champion of the bleacher set and a steward to the history the Cubs have there and the history of baseball writing Chicago continues have. Also, he's a Mizzou guy. The computer bag has a bit of lore up in Chicago. It's a talisman of sorts. I once posed for a picture with it because it's such a celebrity in the press box. Hence, the joke. Next I'm going to suggest that Gordon Wittenmyer's choice of sportcoats is boring. I mean, dude, mix in some colors. Let's really stir this up. Let's see your computer bag, is it Boba Fett themed? Is Shreve's spot on the team for opening day pretty secure? Was there anything particularly interesting or unexpected at WWU as far as comments by anyone in the organization? The Ozuna comments were noticeably honest and lacking of detail, showing what the team understands about his health and why they wish he would move closer to their facility for a checkup. My computer bag, unlike Sullivan's, is not boring. It has flair to set it apart. Would the team consider trading Ozuna midseason if the right deal came along and he was producing at a 2018 pace with still noticable issues in the arm/shoulder? If they're a seller and slipping out of the standings sure. But they'd have to get a better offer than the comp draft pick they're going to get -- along with the bonus money. Who are your locks for the bullpen at this moment? Miller. Hicks. Mayers (out of options). Cecil, if he pitches well. Hudson. That's a good start. How much will the new CBA weigh on the league the next few years? How much of a driving force has this been in the dry FA landscape the past two years? Tons. With the force of Jupiter's largest moon and heat of a sun flare.